The season 2 premiere date for ‘Outlander’ has revealed. Read below for more. Starz has announced that Season 2 of “Outlander” will premiere Saturday, April 9 at 9 p.m., almost a year after the show aired its Season 1 finale on May 30, 2015. 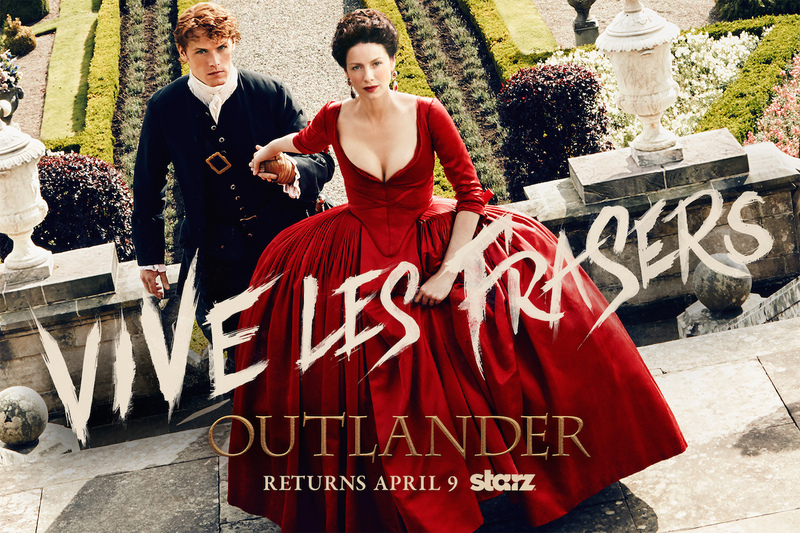 The premium cabler also revealed a first look at the teaser art for the second season, featuring protagonists Claire Randall Fraser (Caitriona Balfe) and Jamie Fraser (Sam Heughan) on the steps of Versailles. Instead of swords and guns, they’re armed with political savvy and the finest 1700s Parisian fashion as they embark on their new mission — infiltrating the French aristocracy and rewriting history. The show boasts a number of new additions in Season 2, having recently cast the pivotal roles of Roger Wakefield (Richard Rankin) and Brianna (Sophie Skelton), characters who are well known to fans of Gabaldon’s books. Book Two of “Outlander” begins as Claire and Jamie arrive in France, hell-bent on infiltrating the Jacobite rebellion led by Prince Charles Stuart (Andrew Gower), and stopping the battle of Culloden. With the help of his cousin Jared (Robert Cavanah), a local wine merchant, Jamie and Claire are thrown into the lavish world of French society, where intrigue and parties are abundant, but political gain proves far less fruitful. Altering the course of history presents challenges that begin to weigh on the very fabric of their relationship. However, armed with the knowledge of what lies ahead, Claire and Jamie must race to prevent a doomed Highland uprising and the extinction of Scottish life as they know it.